Fleet managers, more than most, understand how GPS vehicle tracking keeps fleet businesses alive. All it takes is some inexpensive technology and a few space satellites to help fleet companies recover stolen vehicles, monitor vehicle diagnostics, improve vehicle efficiency, and reduce delivery times. But how did all of this begin? How did fleet companies begin to take advantage of revolutionary GPS technology? In this blog, the fleet management experts at Skypatrol will answer these questions and more, giving you a thorough history of the GPS and how it eventually became a staple of the fleet management industry. GPS technology is not a recent development. In fact, GPS technology was brainstormed as early as the 1960s, with many of the first GPS technologies put into place in the mid to late ‘70s. 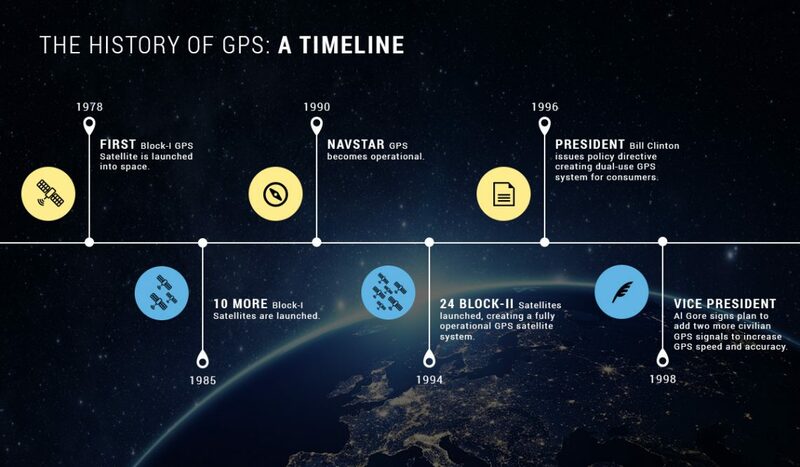 The story of GPS in fleet vehicles began in 1978, when the experimental Block-I GPS satellite (created by Rockwell International) was launched into space. This was a trial run of sorts for widespread GPS technology, and a successful one at that—by 1985, 10 more Block-I satellites were in space. These satellites were primarily used for military purposes, but they had limited scope—there just weren’t enough GPS satellites in space yet to for widespread tracking of vehicles. It took nine more years before the world would see a fully operational GPS satellite system—on January 17th, 1994, 24 Block-II satellites from the US Air Force were launched into space to complete the GPS network. As we stated earlier, early GPS was used for military purposes, helping military units keep tabs on important vehicles during missions. At this time, the general public was aware of GPS, but didn’t seem to have any sort of interest in the technology. It wasn’t until 1996 that US President Bill Clinton helped the public see the mass-market potential of GPS—he was very outspoken about the possibilities of GPS for the military and civilians alike, and issue a policy directive that developed a dual-use GPS satellite system that could be used for the interests of the general public. This policy change allowed the average civilian to gain access to GPS technology, including fleet managers—who initially saw the benefits of being able to keep tabs on the locations of their vehicles. GPS was available in its early stages, but it wasn’t necessarily cheap. In order to track fleet vehicles, each and every vehicle had to be outfitted with a large, clunky, and expensive GPS tracking device. Plus, companies had to pay a hefty fee just to access the GPS satellite system. 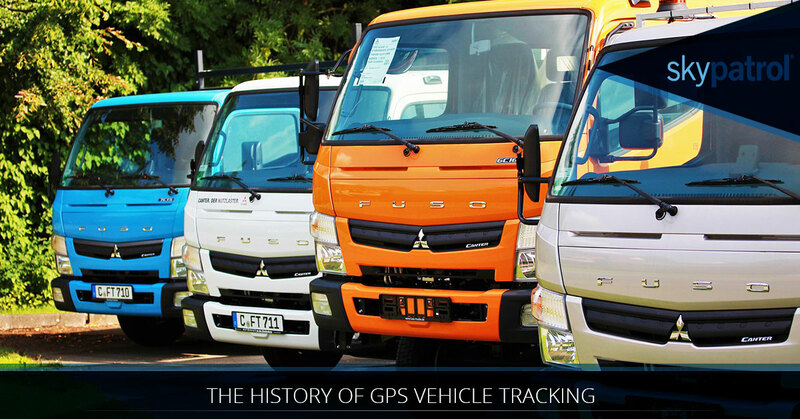 Combined with the slow growth of computer technology and even slower internet speeds, GPS was a technology saved for only the wealthiest and most powerful fleet companies, creating a larger division of wealth between the top-tier fleet companies and smaller companies looking to make their mark on the industry. Fortunately, two decades of technological advancement has since leveled the playing field in the world of GPS vehicle tracking. With an increased capacity for GPS satellite systems, (and more systems for consumers to work off of) prices for GPS accessibility dwindled. This, paired with the increased accessibility of GPS software and faster internet connections, has dramatically lowered the cost of installing fleet GPS systems and made it simpler to access and use than ever before. Today, fleet managers and companies have more control over their fleet vehicles than ever before. GPS tracking systems can keep tabs on fuel usage, driver speeds, idle times, driving patterns, and driver routes, and cross-reference this data with bulk data from the past to gauge improvements on driver and fleet efficiency. Fleet managers can even compare driver routes to real-time traffic to help their drivers avoid traffic jams and make quicker deliveries. It doesn’t matter the size or the type of fleet—GPS tracking and fleet management software systems are easy to install and easy to manage on virtually any budget. But where will these systems go in the future? Ultimately, the fleet management software industry can make some improvements to improve driver safety by monitoring driver behavior more closely, and allowing managers to create safe driving incentive systems so drivers have more reason to make good decisions on the road. GPS tracking also must improve its overall accessibility on portable devices. While products like Skypatrol’s Fleet Command allow users to access fleet management software on their most popular devices from a simple web platform, others must find ways to ensure fleet managers can manage their fleets—even when they’re not in the office. Overall, GPS tracking technology and fleet management software has come a long way in the few past few decades, and that progress has rubbed off on the fleet industry. The need for reliable fleets in the United States is growing rapidly—from $9.54 billion in 2016 to a projected $27.9 billion industry by 2021—and it goes to show how a few small satellites have proven to be so valuable to the fleet industry and American commerce.